I wanted to briefly talk about the presentation of recent Cypriot history in Turkish and Greek textbooks. This subject was treated very adroitly in the volume edited by Rebecca Bryant and Yannis Papadakis entitled Cyprus and the Politics of Memory, and I don’t want to beat a dead horse. But there’s a few interesting observations I’d like to make towards the end of this post. Cyprus is an island in the Mediterranean with a long documented history, including Mycenean settlement in the second millennium BCE and a Greek presence since. In the past four thousand years, the island has been governed by many major powers, including – in chronological order – Egyptians, Romans, Venetians, Ottomans, and the British. In July 1878, the British Empire assumed control of the island from the Ottoman Empire. This short background is necessary to understand the context for the narratives I discuss here. A demonstration for enosis in the 1930s. and spreads its sibilant collar on a lace shore. that echoed from a cave-mouth when the tide has ebbed. Derek Walcott’s masterful Omeros is a palimpsest. As an epic poem, it is deeply indebted to Homer; as a portrait of St Lucia, it is bound to the daily rhythm of island life. 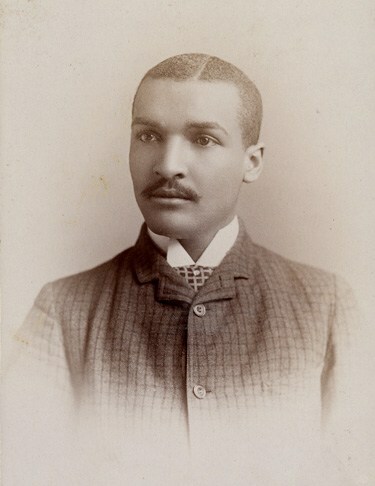 It is this tension between rootedness in the Caribbean and participation in the “global republic” of English (to borrow from Paula Burnett) that Walcott explores in his imagination of a postcolonial world. Reading Omeros means inhabiting the contradictions inherent in the postcolonial condition. Walcott’s poetic work is an extraordinarily successful exploration of modern life, all accomplished in poignant and achingly beautiful lyric verse. In Fall 2017, I was fortunate enough to take an engaged course in the French department called L’expérience des réfugiés et immigrés (The Experience of Refugees and Immigrants). This course was developed last summer and offered for the first time this year (see article for more). It combined a survey of Francophone texts by and about migration with an engaged component: working with Women’s Refugee Care (WRC). My French improved because I got the chance to use it in a setting with no safety net: in the community engagement portion of the course, French really was the best means of communication. More importantly, this course was a great opportunity to get involved with a local nonprofit and explore the idea of engaged scholarship (which I’m continuing to do through the Engaged Scholars Program in Archaeology). My work with Women’s Refugee Care centered on three interviews I did with members of the Congolese refugee community here in Providence. Along with Jeanelle Wheeler, my wonderful colleague, we got to know the community, attending a few gatherings and meeting lots of interesting people. We then arranged interviews with a few of those we met at their homes. After recording the interviews, we translated them into English and then posted them on the WRC blog. My mother was born and raised in Limassol (Lemesos), a city on the southern coast of Cyprus which I also lived in for five years. The city proper is not ancient; the oldest building is the medieval castle. Yet the Limassol metropolitan area is anchored at its western and eastern ends by the ancient cities of Kourion (Curium) and Amathus, respectively. Going to the beach, to a restaurant, or visiting friends often involves passing by these very tangible reminders of classical antiquity. Examples of neoclassicism also abound, though they often take surprising forms. Cypriot buildings that draw on classical elements are mostly unlike the civic architecture of, for example, Washington, DC; to put it uncharitably, Cypriot neoclassicism is generally “touristy” and “kitsch.” One characteristic example comes to mind: a structure called Aphrodite’s Temple that was built just a few hundred meters from my school in Palodia, around ten kilometers from Limassol. A few months after Aphrodite’s Temple opened, police raided the building and arrested the operators on charges of sexual exploitation. The owner’s lawyer threatened to reveal the names of prominent government officials who patronized the brothel if the prosecution continued. The intermingling of classical antiquity and powerful interests – including the archbishop of Cyprus, according to one source – demonstrates how the material legacy of classical antiquity continues to be meaningful in Cyprus. When I attended Cypriot public school, I remember glancing at the back cover of many textbooks in moments of boredom. Staring back at me from some corner of the textbook’s cover was almost always an owl standing on a pile of books. Many years later, I visited the RISD museum and stopped in front of their display of ancient Greek coins. There again was that same owl, staring at me with its bulging eyes. As it turns out, at the time I was in primary school many Cypriot textbooks were published by the Οργανισμός Εκδόσεως Διδακτικών Βιβλίων (Organismos Ekdoseos Didaktikon Vivlion, State Organisation for the Publication of School Textbooks), or ΟΕΔΒ for short. This organization was founded by the Metaxas dictatorship in 1937, which had close ties with Greek nationalism.1 ΟΕΔΒ has long played a crucial role in the propagation of state ideology, as might be expected from a state-sanctioned publisher. For example, ΟΕΔΒ is tasked with producing history textbooks by the Ministry of Education. The aims provided by the ministry include “developing an ‘awareness of Hellenic continuity’” and “cultivating genuine national pride.”2 The role of ΟΕΔΒ in the construction of Hellenism intertwines state authority and the legacy of classical antiquity. Nowhere is this better symbolized than in ΟΕΔΒ’s logo, which is little more than a stylized version of the Athenian owl (see above). The owl was a symbol of Athena and of wisdom. 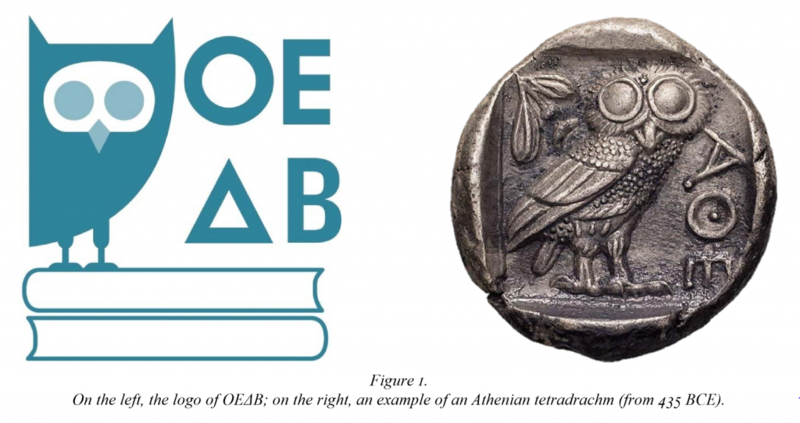 In this role, the owl was famously used as the reverse of the tetradrachm – a type of silver coin – minted in Athens from at least 500 BCE.3 ΟΕΔΒ clearly paid homage to this coin in its choice of logo, thus also identifying classical Athens as the root of education in the modern Greek state.